Back in July 2014, Magic Pixel Games and Bandai Namco announced Outcast Odyssey, the pair’s collectible card battle game, for mobile. The game has now officially launched on iOS and Android devices, taking players to a world where the strategy of card-battle games meets RPG-inspired dungeon crawling. In Outcast Odyssey, users explore environments to collect new cards, hopefully creating a stronger deck with every encounter. In each level-based mission of the game’s single-player campaign, users tap on clouded regions of a map to uncover the land underneath. These cloud-covered squares may contain free coins, enemies to battle, treasure chests or movement portals that move the team to another part of the map. During combat, damage is determined according to the relationship between three major elements (think rock, paper, scissors). Users tap on key areas on a monster card to do damage, and can trigger combos with the right moves. Monsters can attack back, and teams will heal automatically over time (that is, they don’t fully heal after battle). This adds a makeshift energy system to the game, as users are limited to only playing the game when their team has enough health to successfully battle. When their health is totally exhausted, players must wait for their team to be revived, or use health potions to revive it instantly. Health is also refilled as players earn overall experience point levels (separate from a card’s individual level). Each mission has a specific number of available card drops, so players can replay missions multiple times in order to earn all of the game’s available cards. These mission maps contain a randomized assortment of prizes (like those treasure chests and coin bundles), giving players a slightly different experience each time they complete the same mission. Specifically, treasure chests offer a lottery-style card reward system, as players turn over coins until three match, with the type of coin determining the rarity of the rewarded card. As users collect cards, they can create up to five separate attack and defense decks, or enhance and eventually evolve their cards by spending “lesser” cards on those they’d like to keep. Users can purchase additional card packs using free or premium currency. Multiplayer gameplay is also available in the game’s arena mode, or cooperative guild mode. In addition, a bounties system sees users claiming bounties and completing specific bounty missions for a chance at rare reward cards. Users must purchase access to these bounties using premium currency or free bounty items they receive while playing. As players level up, they earn mastery points that can be spent on a hefty skill tree, unlocking things like a larger card inventory, boosted experience points when enhancing cards, increased damage dealt when attacking other real players, and much more. The game’s artists include comic book artists Warren Louw and Chuck Pires, who helped design the hundreds of hand-drawn cards available in the game at launch. “The experience has been incredibly fruitful, and we’re excited to partner with a variety of up-and-coming artists on future releases of Outcast Odyssey and our other mobile titles,” Riego added. 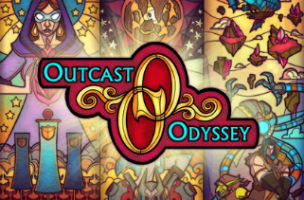 Outcast Odyssey is available to download for free on the iTunes App Store and Google Play.